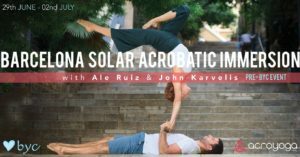 This Immersion gives you the chance to dive deep and fully absorb not only the advanced AcroYoga & Acrobatic training techniques, but also the Catalan sun, the community feeling, Barcelona itself – a beautiful seaside town and optional your participation in the BYC. **CANCELATION POLICY**: You are free to give your spot to another participant at this level. The deposit payment is not refundable.